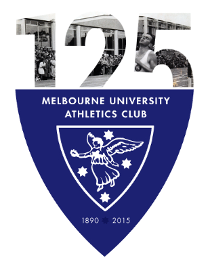 Hannah Alderton and Kath Clarke won Victorian Championships and a substantial contingent of Melbourne University Athletics Club athletes took the club to 5th place in the HH Hunter Shield in the Victorian Track and Field Championships held from 9th-11th of March. Hannah Alderton took the Victorian High Jump Championship with a leap of 1.70m and will be looking to go higher at the Australian Championships in a few weeks time. Kath Clarke won a thrilling 400m race in 55.35 to claim the Victorian Championship (watch the video below to see the race). John Peavey jumped 2.00m to claim bronze in the High Jump, with squad mate Mitch Mackenzie just behind in 4th. Cath MacRae vaulted well to take 4th in the Pole Vault, clearing 3.70m. Hamish Beaumont took 4th in the 3000m Steeplechase. 23 MUAC athletes competed across the 3 days of the Victorian Championships taking MUAC to 5th place in the HH Hunter Shield. The result, along with a 2nd and 4th at the Athletics Victoria Shield Final, demonstrates the strength and depth present in the MUAC athlete cohort. Upcoming competitions for MUAC athletes include the Australia Junior Championships, Victorian Milers Club meets, Rare Air Club competitions, the Stawell Gift and the Australian Athletics Championships.